BREE CLARKE is the founder & Creative Director of THE IMAN PROJECT & LAVENDER MINT DESIGNS. 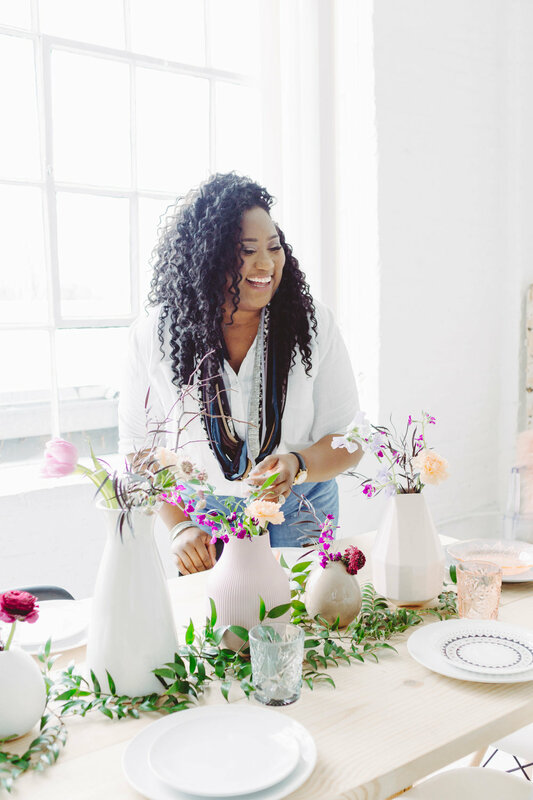 She has combined her passion for design as well as purpose of community & diversity by creating magical moments such as On The Table ” Workshops with a Purpose, Mama Mode: Events Celebrating Modern Motherhood, Brunch & Build, The Giving Table Project just to name a few projects. In all the work she does, Bree seeks to empower others and bring people together no matter the color of their skin, their style, background, age, religion or opinion. This is done through her empowering workshops. Along with building and designing handcrafted, affordable farmhouse tables and furniture alongside her husband. Her passion & purpose has certainly not gone unnoticed. Bree & her work has been featured on Good Morning Texas on multiple occasions. As well as published in local & national magazines such as BELONG Magazine, Forbes, Brides of North Texas, D Magazine, Inspire N Style and many other media & press outlets. Brees’ main goal from the time she started her small business was to build affordable furniture and create a beautiful community, while thinking of others needs and wants.